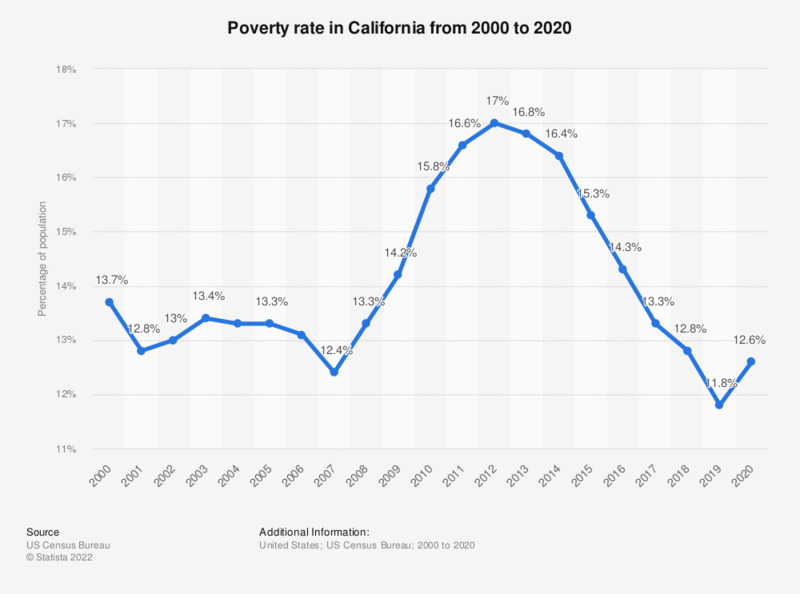 This graph shows the poverty rate in California from 2000 to 2017. In 2017, about 13.3 percent of California's population lived below the poverty line. Represents number and percent below poverty level in the past 12 months. Prior to 2006, the American Community Survey universe was limited to the household population and excluded the population living in institutions, college dormitories, and other group quarters. Starting 2006, it includes the population living in institutions, college dormitories, and other group quarters. Poverty status was determined for all people except institutionalized people, people in military group quarters, people in college dormitories, and unrelated individuals under 15 years old. These groups were excluded from the numerator and denominator when calculating poverty rates.